South Dakota was not at the top of my travel bucket list, but both my mom and mother-in-law have wanted to visit Mount Rushmore for years. The more I researched a trip to Mount Rushmore and surrounding areas the more excited I became about visiting South Dakota. I finally planned a girls’ South Dakota weekend trip and am so glad I did. 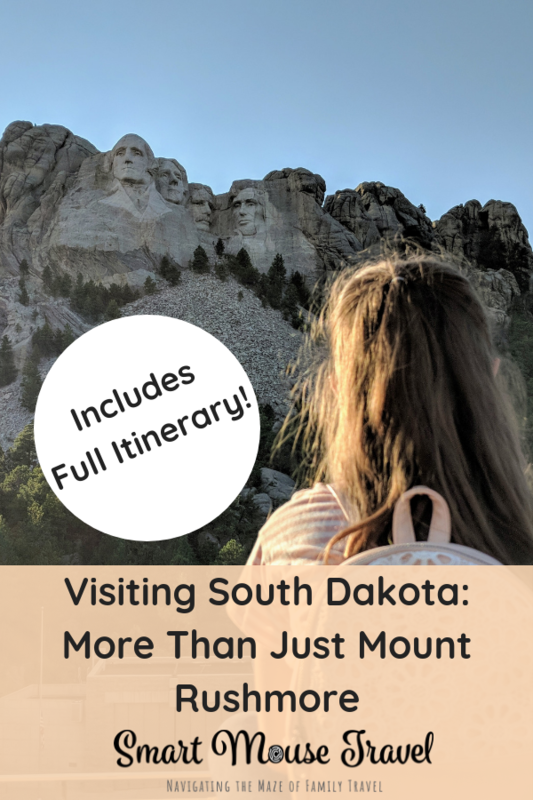 Our South Dakota itinerary was perfect for a long weekend and even has a little extra on the agenda in case you have more time to visit the area. I will review the activities we liked best from our trip and then include our full South Dakota itinerary at the end of the article. It should be no surprise that visiting Mount Rushmore is at the top of our list of Black Hills, South Dakota activities. This unique National Memorial is what brings many people to the area, including ourselves. 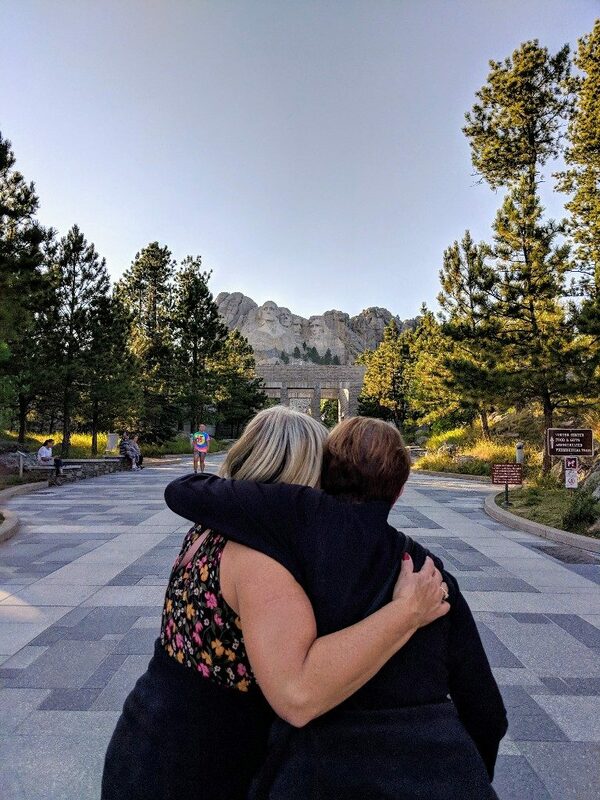 Since visiting Mount Rushmore was on both my mom and mother-in-law’s bucket lists I knew it would be our first stop once we arrived in South Dakota. Thankfully our flight into Rapid City arrived on time in the early afternoon. We took the hour drive from Rapid City Airport into Custer, South Dakota. Although not the most direct route to Mount Rushmore we decided to find our way to our cabin while we still had daylight. After dropping our suitcases we took the 30-minute drive to Mount Rushmore. Mount Rushmore was really emotional for the moms. Seeing their reaction to this iconic piece of America was a special experience. I am incredibly grateful that I was able to be part of fulfilling a dream. The monument itself is really impressive. We spent some time admiring it from the upper pavilion area before walking the Presidential Trail. The Mount Rushmore Presidential Trail is an easy, short hike that takes you closer to the base of the mountain. There are some informational plaques and great photo opportunities along the trail. Don’t be afraid to ask other visitors to take pictures of your group. We grabbed a quick meal at Custer Carvers. 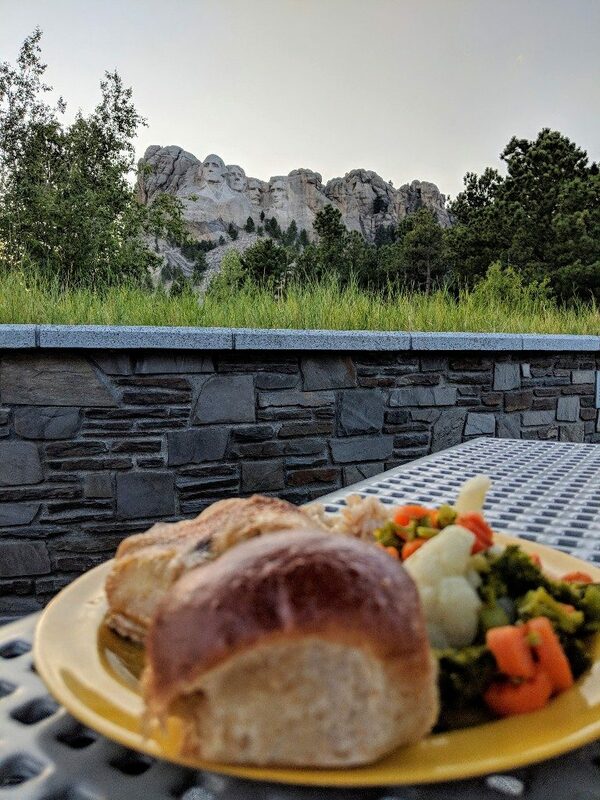 Custer Carvers is one of several on-site food options in a large cafeteria at Mount Rushmore. Although the food was unremarkable, I could not have asked for a better view for our dinner. After dinner there was only a short time for us to explore the Lincoln Borglum Visitor Center before the Mount Rushmore Evening Program was scheduled to begin. The Mount Rushmore Evening Program takes place most days in the amphitheater in front of Mount Rushmore. The evening program is a 10-minute ranger-led talk followed by a 20-minute video about Mount Rushmore and the featured presidents. Then Mount Rushmore is lit with bright lights while America The Beautiful plays. At the end of the program there is a touching thank you to servicemen and women. I had no idea how emotional the evening program would be when I had originally planned to attend. At the end of the program any veteran of the U.S. armed services (or a family member of those who have been lost) are invited to the amphitheater stage. The crowd cheered wildly to thank these members of the armed forces. Several of the veterans then participated in the flag removal ceremony for the night. Pro Tip: I highly recommend trying to see Mount Rushmore in the afternoon and then sticking around for the evening program if possible. Needles Highway is also known as South Dakota Highway 87 and runs through Custer State Park. This scenic drive winds its way through beautiful forest and stunning rock formations. These giant eroded granite pillars are called The Needles and are a popular sightseeing and rock climbing destination. Needles Highway is a popular drive in Custer State Park and will take at least an hour. 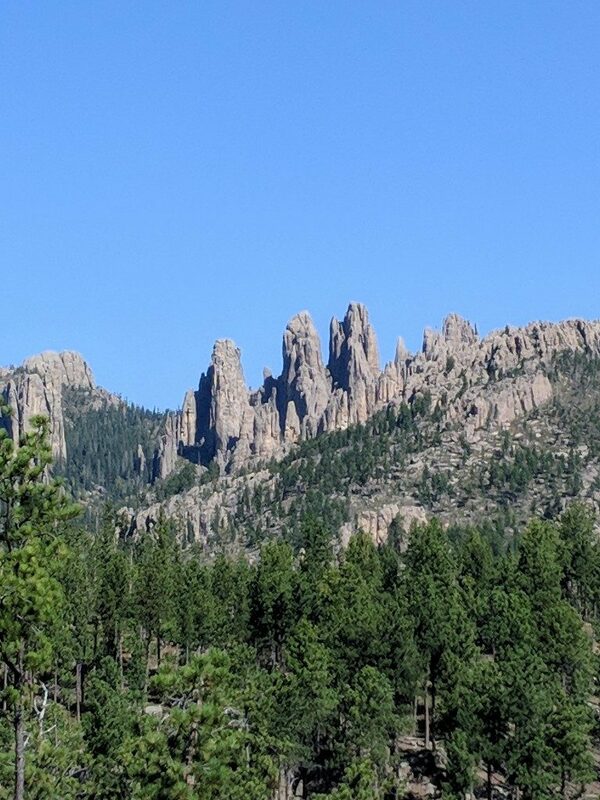 We stopped at several overlook areas on Needles Highway to stretch our legs and admire the gorgeous views along the drive. The main draw of Needles Highway are the three incredibly narrow tunnels formed through the surrounding rock. There are 3 tunnels on Needles Highway: Hood Tunnel, Needles Eye Tunnel, and Iron Creek Tunnel. Each of these tunnels are extremely narrow with widths ranging between 8 feet 4 inches to 10 feet 6 inches (2.5 m to 3.2 m) and height clearances of 9 feet 10 inches to 11 feet 4 inches (3 to 3.5 m). We entered Needles Highway from the southern entrance near Legion Lake Lodge. Entering Needles Highway here gave me a chance to acclimate to the winding, narrow roads for a few miles before reaching our first tunnel. At the time the tunnels seemed narrow, but not scary. However, looking back at the videos and pictures I sometimes have a hard time believing that our rental Toyota 4Runner made it through. Be prepared for lots of blind corners and narrow roads along Needles Highway. This is also a popular motorcycle drive, so be extra mindful of motorcyclists. At the end of our Needles Highway route was Sylvan Lake Lodge. This beautiful and rustic lodge was a great place to stop for lunch and a bathroom break. After lunch we walked around near the lodge to admire more of the views of Custer State Park before finishing the Needles Highway drive. This was hands down one of the most memorable parts of our South Dakota trip. Pro Tip: Don’t rent a car that makes you feel uncomfortable driving. The rental service upgraded us to an Expedition, but I knew I did not want to drive narrow roads or pay for fuel in such a large vehicle so I refused the upgrade. Custer State Park is 71,000 acres (290 sq km) of diverse terrain and is home to many types of animals. The Wildlife Loop is a popular way to see a variety of animals that call Custer State Park home. The best time to drive the Wildlife Loop is in the morning or late afternoon/early evening, when the animals are usually most active. The Wildlife Loop drive makes a large circle through a prairie inside the park. Our drive along the Wildlife Loop got off to a slow start with only one or two animals, but then we found a huge herd of bison (also known as American buffalo). We pulled over on the side of the road and watched several little bison interacting with the older ones of the herd. On our drive around the Wildlife Loop we saw bison (buffalo), donkeys, pronghorn, wild turkeys, deer, and prairie dogs. 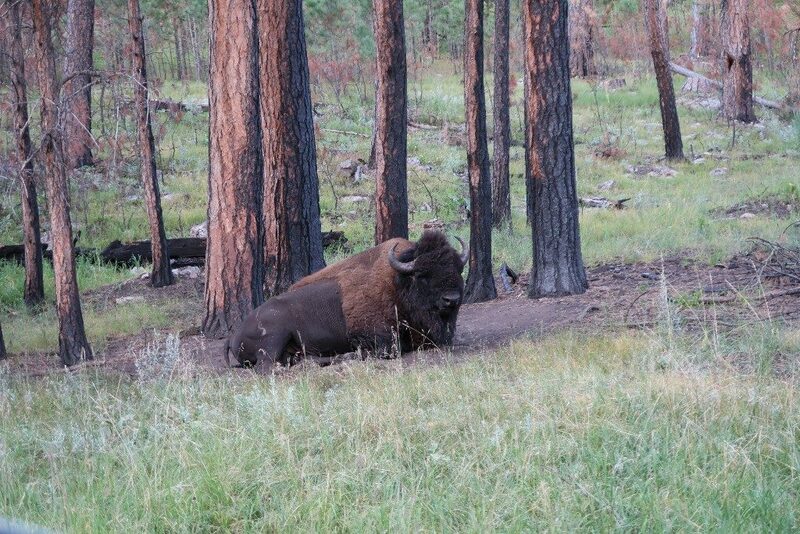 Right before we rejoined the main road a gorgeous bison was resting along the side of the road seeming to pose for us. We could not believe how close he was and we stayed in the car while we took our pictures. There are two popular cave systems in the Black Hills of South Dakota, Wind Cave and Jewel Cave. 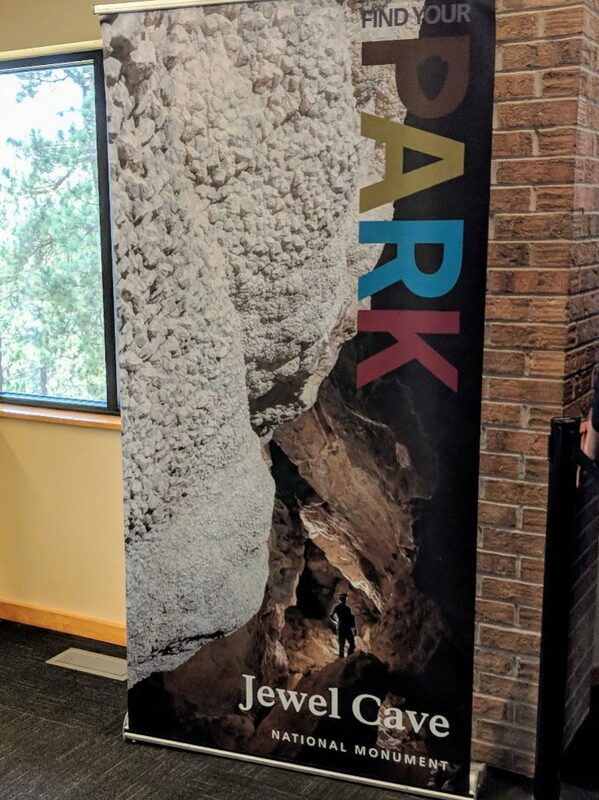 We opted for a tour of Jewel Cave National Monument, as it has several unique cave formations and is the third longest cave in the world with over 195 miles (310 km) of mapped passageways. My mom and I have done cave tours before at Mammoth Cave in Kentucky, but this was a first for Elizabeth and my mother-in-law. We pre-purchased tickets for the Scenic Tour of Jewel Cave. The Scenic Tour is listed as moderately strenuous, and I would definitely agree that it was a challenging workout. The tour starts with your guide taking you down an elevator to the start of the path. During the tour you will walk about a half mile and climb and descend 723 steps (about the equivalent of 40 flights of stairs). The path winds its way through several areas of Jewel Cave. During our tour we learned the difference between nailhead spar, dogtooth calcite, and even “cave bacon.” Our guide did a great job of explaining how the caves were formed and even educated us how the cave is still being actively explored. The Jewel Cave Scenic Tour takes about 80 minutes and really is moderately strenuous. If you pre-purchase your tickets make sure to exchange your printed email confirmation for official tour tickets at the ticket booth before entering the visitor’s center. Our home base for our multi-generational family trip to South Dakota was Custer, South Dakota. Custer is a small town with a walkable downtown area. There are several restaurants, coffee shops, and souvenir shops within just a few blocks. We enjoyed our meals at The Begging Burro, Buglin’ Bull Restaurant, and Black Hills Burger and Bun Co. Please know that restaurants and shops close pretty early in Custer even during the summer tourist season. Most places were closed by 9pm on Labor Day weekend. During our weekend in Custer there was a Studebaker car show. We enjoyed walking around and admiring the classic cars. 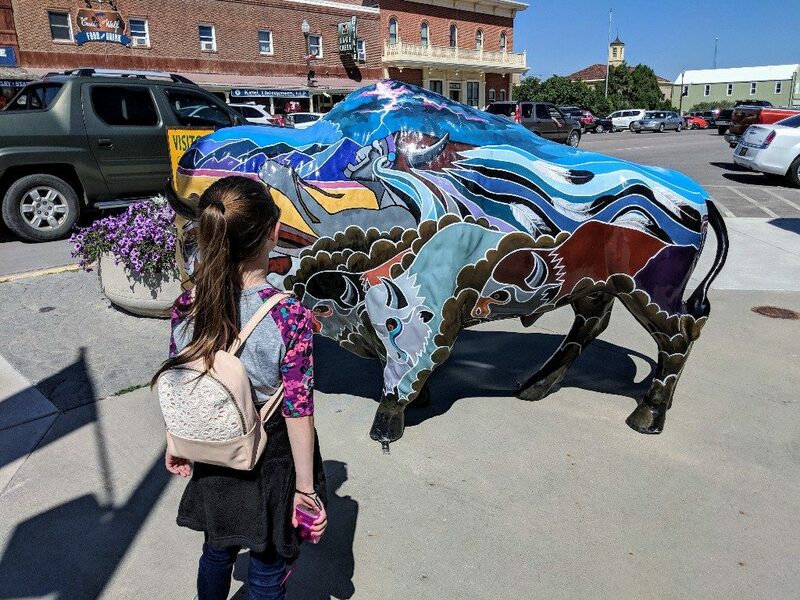 Another fun thing we did in Custer was try to find as many colorful buffalo statues as possible. The buffalo were located along Mount Rushmore Road and side streets in downtown Custer. These decorated buffalo each had a different theme and the artwork was really impressive up close. Want To See Our 3 Favorite South Dakota Drives? I put together a video of our favorite South Dakota drives. See for yourself why these were such amazing and unique experiences. 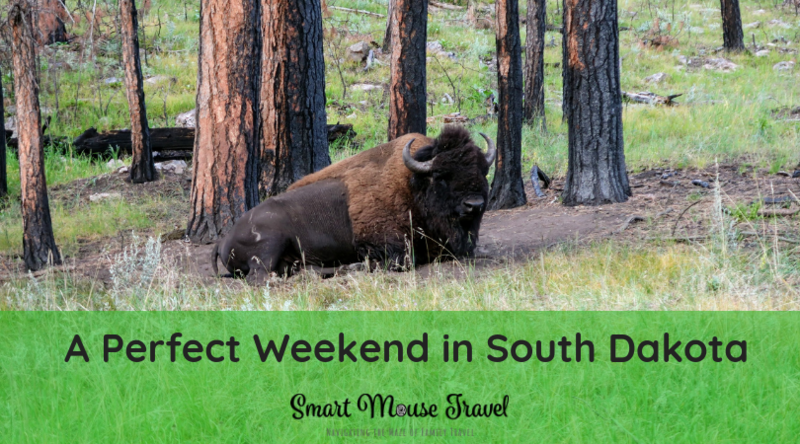 Our weekend of activities in the Black Hills listed above was a perfect South Dakota weekend itinerary. We saw a lot, but also had time to relax, enjoy the views from our cabin, and spend time together. However, bad weather in Chicago cancelled our flight home. Although a cancelled flight is never fun, we decided to make the most of our extra 24 hours in South Dakota with the following activities. Have you ever seen a Wall Drug bumper sticker on a car and thought what the heck is that?! Wall Drug is a road trip mecca drawing nearly 2 million visitors each year. This roadside attraction started in 1931 as a small drug store in Wall, South Dakota. Legend has it that to attract visitors the owners offered free ice water and 5-cent coffee with dozens of billboards along I-90. You can still grab 5-cent coffee and free ice water, but now Wall Drug offers a pretty eclectic assortment of items. Need a some cowboy boots, a buffalo burger, or maybe a kitschy ornament? Wall Drug has got you covered. Unfortunately, we only had a short time to explore this unusual place before we needed to move onto Badlands National Park. 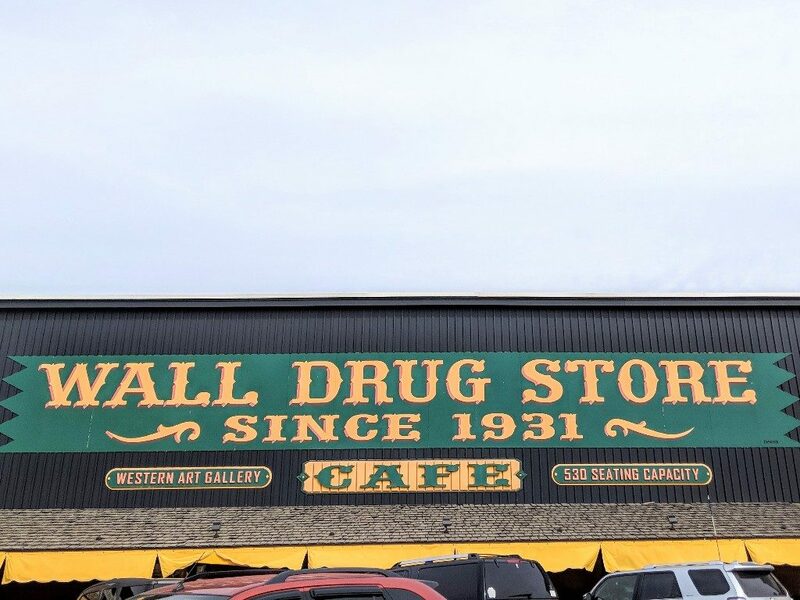 Wall Drug is a great place to explore, buy random souvenirs, and use the restrooms before or after stopping at Badlands National Park. Badlands National Park encompasses almost 250,000 acres (1000 sq km) of towers, canyons, and tables of soft sedimentary rock. Each layer of the Badland buttes represents a different time period. The rock layers range from around 70 million years old on the bottom Pierre Shale layers to around 30 million years at the top of the Sharps Formation. The Badland buttes erode at an average rate of one-third inch per year and is a treasure trove of ancient fossils. Driving the scenic Highway 240 loop wound us through the varying landscape. The tall spires and low valleys with their layers of colors were an impressive sight. We stopped at a couple of scenic overlooks for pictures and also walked the Fossil Trail. The Fossil Trail is actually a raised deck walkway with informational signs about fossils that have been found in the Badlands. If you have time I highly suggest you get a Junior Rangers booklet to help your kids learn about Badlands National Park. I struggle to describe the experience of walking on the crumbling sedimentary rock, the lines of color, and the wind blowing bits of the rock around us as we surveyed the park. 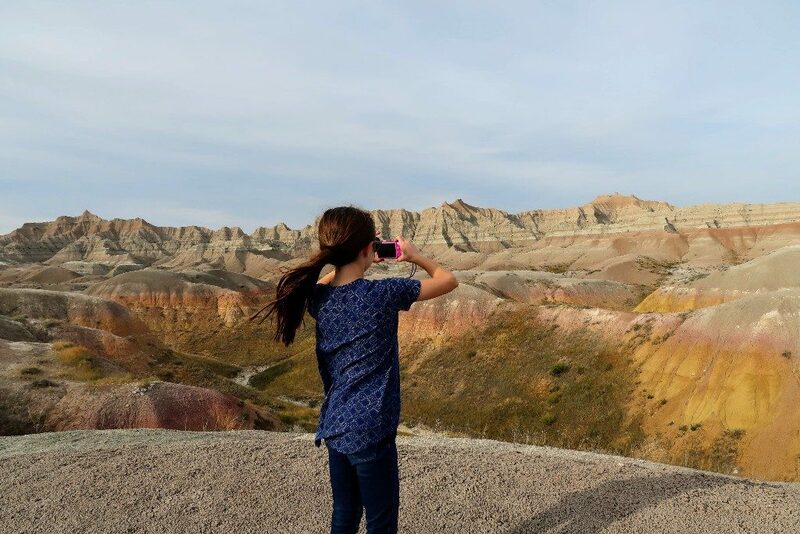 If you have an extra day to explore South Dakota then I would recommend adding Badlands National Park to your South Dakota itinerary. Since our flight had been cancelled and we couldn’t get home until the next evening we had to find a last-minute place to stay in Rapid City. Thankfully Mr. Smart Mouse is a pro at finding me emergency hotel rooms, and we stayed at Hotel Alex Johnson in historic downtown Rapid City. Hotel Alex Johnson is a cool, updated, historic hotel that we all really liked. That night while Elizabeth slept I looked for something to do before our flight home. 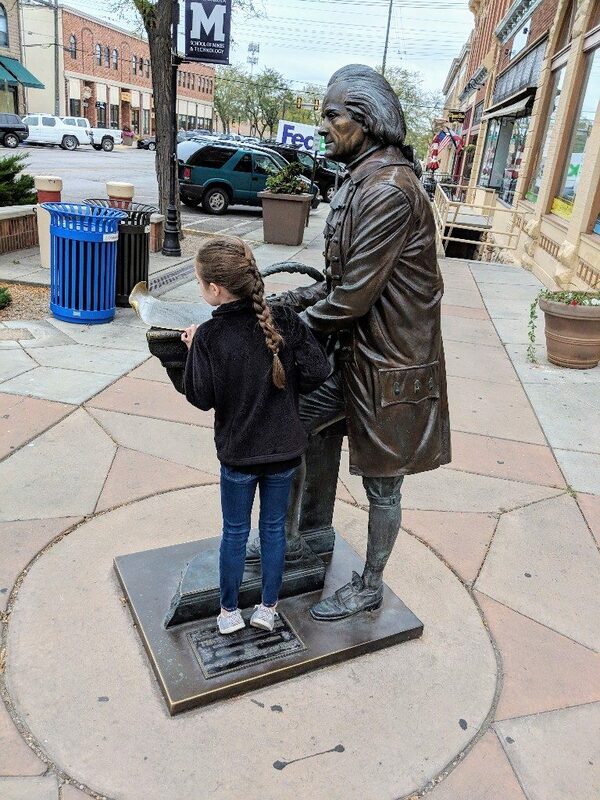 I found several options nearby, but the one Elizabeth chose was walking around downtown Rapid City to look at the cute shops and tour the City of Presidents. The City of Presidents is a series of life-size statues located around Downtown Rapid City. It was actually a lot of fun trying to guess the Presidents from far away and see how good we were at identifying them. Elizabeth had fun posing with the statues. Overall it was a great way to spend a couple of hours before we had to head to the airport again. We had a fabulous breakfast at Tally’s Silver Spoon before we started our tour of downtown. From there we scoped out the City of Presidents and would duck into shops that we found interesting. We got Elizabeth a cute necklace from a vintage shop and walked down memory lane while exploring a huge antique mall. For a trip I wasn’t sure I wanted to take I have not stopped talking about our amazing family trip to South Dakota. Mount Rushmore is what brought us to South Dakota, but there is much more to see and explore. 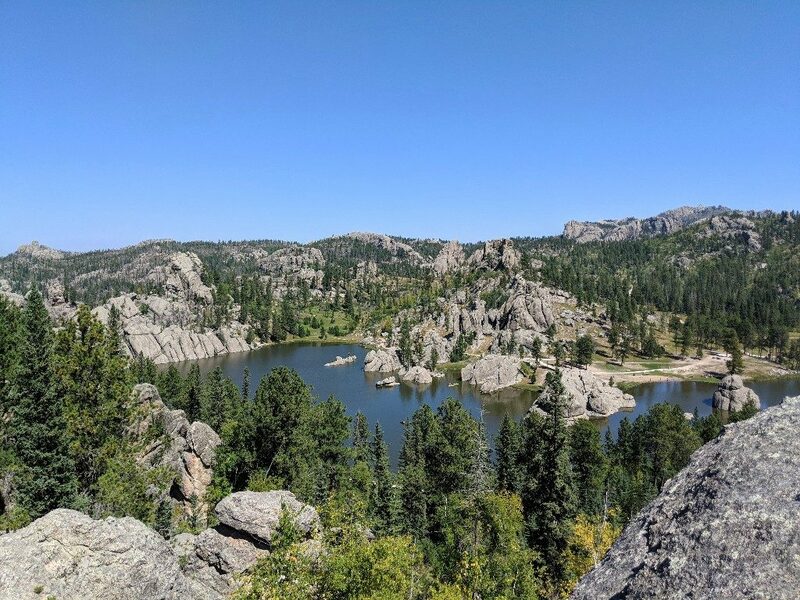 Custer State Park with the Wildlife Loop and Needles Highway drives, Jewel Cave, the town of Custer, Badlands National Park, and more made for a trip of a lifetime for my mom, mother-in-law, daughter and I.
I cannot recommend a trip to South Dakota strongly enough. You can incorporate my South Dakota weekend itinerary into a longer road trip over the summer or it can be a standalone trip like we did. Our flight was delayed and then cancelled. I hope you get to skip this step. Drive to the Rapid City Airport and actually fly home! 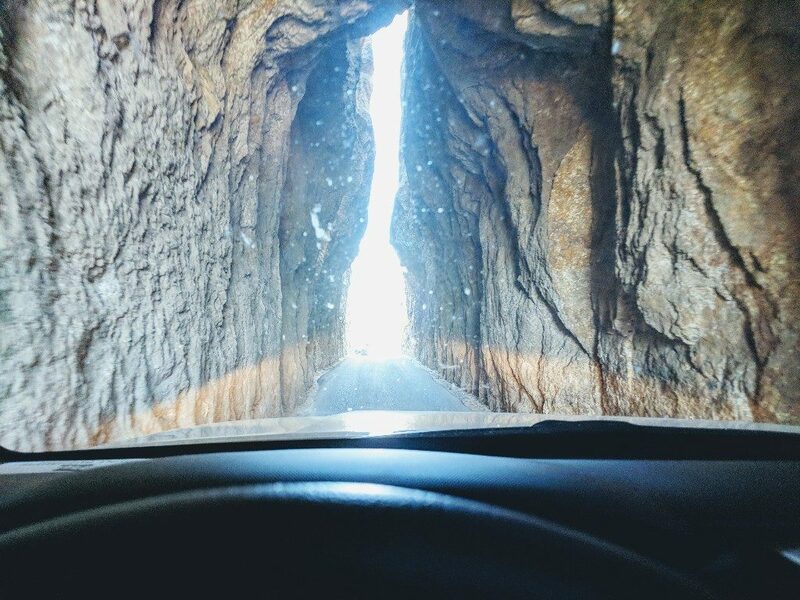 Needles Highway was such a unique experience. I hope you make it to South Dakota to see it and Mount Rushmore!